California has some hurdles to overcome in meeting the most ambitious clean energy goal in the country. Gov. Jerry Brown signed SB 100 Monday, requiring that 100 percent of the state’s electricity must come from solar, wind and other emissions-free sources by 2045. He also signed an executive order that directs the state to achieve "carbon neutrality" by the same year, and "net negative greenhouse gas emissions" after that. 'There's no understating the importance of this measure. For the fifth largest economy in the world, moving to 100 percent emissions-free energy would mean a wholesale transformation. But will it bring about the end of fossils fuels in California? If the past is any precedent, it's going to be difficult. So far, California hasn't gotten as much benefit from its capacity for solar as it could. That’s because California has to keep natural gas running to supply energy on cloudy days and at night. So renewable energy has created new challenges for running the state’s electric grid. And grid operators have turned to California’s primary fossil fuel resource, large natural-gas power plants, to solve them. That’s created an uncomfortable marriage between renewable energy and fossil fuels. And it’s one that California policymakers will have to figure out how to dissolve, if the state wants to reach its clean energy targets. "Have no illusions. California and the rest of the world have miles to go before we achieve zero carbon emissions," the governor said Monday, upon signing SB 100. "But you have to begin. You have to get something done. California's been doing stuff that the rest of the world -- most of the world -- is just hoping they might get to someday." The next steps in clean energy will be a bit tougher than what the state has done so far, says Laura Wisland, who works on energy policy for the Union of Concerned Scientists. It wasn’t long ago that solar energy was considered an expensive, niche technology. Then, in 2002, California lawmakers passed the first renewable mandate, requiring utilities to put 20 percent renewable energy onto the grid. Opponents cautioned that the technology would be too expensive and unreliable. “A lot of those fears were really unfounded,” says Wisland. “The cost of renewable energy has come down quite significantly.” Today, solar and wind are competitive with natural gas power. In the years that followed, California lawmakers got even more ambitious, requiring 33 percent renewables by 2020 and 50 percent by 2030. “One of the most important things we’ve done over the years is the legislature has set goals that are within reach but seem like stretch goals at the time,” Wisland says. Today, about a third of California’s electricity comes from renewables, including solar, wind, geothermal, biomass and small hydropower dams. Solar installations, in particular, skyrocketed. In just five years, solar went from less than 1 percent of California’s in-state electricity generation in 2012 to over 11 percent in 2017. But electricity from natural gas has also held steady. In 2017, it represented more than 40 percent of California’s in-state generation. And that’s because solar energy has fundamentally shifted the way the state’s electric grid is run. That’s because solar energy has fundamentally shifted the way the state’s electric grid is run. When the majority of Californians turn on their lights, it’s due in large part to about a dozen people staring at a wall of screens in Folsom, California. It’s the California Independent System Operator, which runs most of the state’s grid. “It’s constantly solving a constant problem,” said Nancy Traweek, who directs systems operations there. When I visited two years ago, it was a sunny day, which meant the state’s solar farms were cranking out electricity. But solar presents a few tricky problems for grid operators. Solar electricity also drops off as the sun sets, but that is the time when the state needs electricity the most, because Californians are coming home from work and turning their lights on. 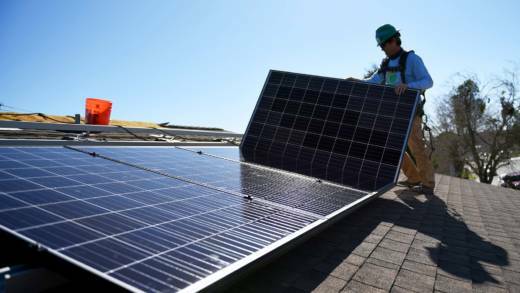 But running solar and natural gas together during the day can create more electricity than is needed, especially in the spring and fall, when Californians aren’t running their air air conditioners. And flooding the grid with too much power can cause it to fail. So, grid operators have to tell solar farms to shut off. And it’s happening more and more often. So far this year, California has forgone enough solar electricity to power San Francisco for 20 days. The extra solar energy could be stored in large batteries or other energy storage technologies, or it could be shared with neighboring states. That would preclude the necessity of turning it off. The state has mandated that California utilities install energy storage. Many of those solutions, however, are still being developed. Maybe that’s why the natural gas industry isn’t quite as worried as you’d think. “The bulk of the modern gas fleet is going to stick around and be needed for a while,” says Matt Barmack of Calpine, which owns 20 natural gas power plants in California. Today, the big batteries on the grid only store several hours worth of electricity. That is not enough to fill big energy gaps created by the weather. But the rise in solar power has upended the economic model for many natural gas plants in California. “It used to be that we would generate the most in the afternoon,” Barmack says. Now, that’s when solar is available at a very low price, and the electricity from natural gas power can’t compete. Barmack says there’s a real risk that many natural gas power plants will go out of business while California still needs them. “I think in some cases that’s OK, because that’s a market signal that the generation from those plants isn’t necessary anymore,” says Wisland. But there needs to be a careful exit strategy for natural gas power, he says. Some natural gas plants are located in places where they’re important to ensure reliable power for a local area. That could be through an existing special energy market in California, known as “resource adequacy.” Power plants get payments that way simply for being available to ensure the grid can function reliably. Some argue those annual payments aren’t enough to keep natural gas power plants around. That’s already led to a controversy over one of Calpine’s natural gas power plants, which was granted extra payments from the grid operators to stay open. While California’s 2045 goal could mean the end of fossil fuel plants as they operate today, there could be a way for them to survive. The state’s electricity doesn’t only have to come from renewable energy, but “clean” sources that don’t produce emissions. That could include large hydropower dams or fossil fuels that don't release emissions. So, Calpine says it’s looking at capturing the carbon emissions from its power plants and trapping them, a technology known as carbon capture and storage. But the technology is still in its early days. The question remains about how fast technology like energy storage will develop to augment renewable energy. So far, at least, the state has met every one of its renewable energy goals.